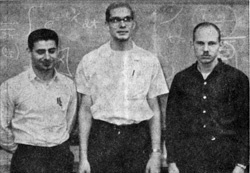 Description: Bethel College Putnam math competition team for the Dec. 1964 competition; left to right, Elias Toubassi, Kenneth Graber, Donald Quiring. The team finished 14th in the nation. Scanned from Mar. 19, 1965, issue of The Bethel Collegian.